Are you looking for a man with a van in Sheffield? Then your search is over! You've found Van Man Hire, a fully insured, professional and friendly removals business dedicated to providing their customers reliable, expert man and van services across the UK, and best of all, our prices are far less than those of the bigger removal firms meaning you get a great low cost removal service wherever you are relocating to! Van Man Hire is a Sheffield based business, providing reliable Man and Van services in Sheffield and the surrounding areas. We also provide a UK wide removal service, moving customers to all corners of the country! All our staff are fully trained and DBS (old CRB) checked. Depending on the size of your move you have the choice of 1 or 2 vans, along with 1 to 6 removal professionals, all who have been working within the removals trade for many years, bringing with them bags of experience and an expert touch to move the most trickiest of items. Your belongings will be transported safely in our vans using rachet straps, bunjee chords and transit blankets. We take care when loading our vans to ensure everything is secure and will arrive at its destination safe and sound. We have carefully prepared a full removals preparation guide to offer you advice, hints and tips to ensure your removal service goes as swiftly and care free as possible. Simply click here or select 'Tips' from the menu's to access our comprehensive guides. We strongly advise that you view our full range of Terms & Conditions to familiarise yourself with the binding contract terms in force when entering into a removal service with Van Man Hire. We currently operate all our removal services in a clean, fully insured Ford Transit Luton Box Van with Tail Lift. Extra vans can be hired depending on the size of the job. You can see pictures of our removal vans here along with their dimensions to help you judge the amount of runs needed for your move. Our Man and Van Sheffield service is fully covered with Goods in Transit and Public Liability insurance. We have displayed these documents on our website here so you can see for your peace of mind before booking a removal service with us. Waste removals in Sheffield. We are an upper tier waste carrier and dealer, and have the appropriate registration certificates in place in order for us to legally dispose of your waste at the commercial recycling centres. You can view our Waste Carriers License here. Preparation is the key for any job or service and removals is no exception. If you want your Man and Van, Sheffield service to go smoothly and efficiently, make sure everything is packed up thoroughly and securely using the correct type of boxes. 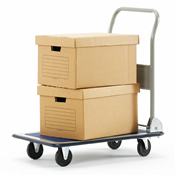 Discount moving packs can be purchased from The Moving Warehouse, our recommended suppliers. Check out our Blog! Here you can find topics on the removals trade plus other various worldly insights! Van Man Hire provide an expert Man and Van service in Sheffield. We also offer Packing Services, Unpacking Services, Cleaning Services and flat pack assembly. Find out more. A professional, high standard removal service is our priority at Van Man Hire. We aim to provide a level of service that leaves our customers happy in the hope you will consider us for any future moves or recommend us to friends and family. Please take a look at the reviews previous clients have left us or leave us a review if you are happy with the removal service we provided for you. We invite you to explore this website and Contact Us for a free no obligation quote. Thank you for visiting Van Man Hire's website, Sheffield's quality, cost effective Man and Van Removals company. We look forward to catering for all your relocation needs!